About: Le Diamantaire was born in Caen, France, in 1987. It was the discovery of Obey’s art in 2001 that initiated his approach to using the street as a field of expression. He then embarks on graffiti and quickly saturates his art in the walls of his hometown so, he begins to work stencil. This technique responds to the desire for artistic expression that is more figurative, accessible and compelling. At the same time, his studies in metalwork introduced him to techniques that gradually nourished his creativity and know-how. Always driven by the desire to better master the art of passing messages, the Diamantaire moved to Paris in 2008 to study visual communication. As artists like Invader, with strong trend-marks, he chooses a powerful symbol: the diamond. From this point he decides that the mirror would be the perfect material to adorn the walls. He picks mirrors on the streets and recycles them to create unique pieces, each one painted and numbered. The first walls embellished by these diamonds are the ones of Paris in 2011. Today, these colorful jewels are delivered to the biggest cities of the world like New York, Montreal, Los Angeles, Miami or Zurich. Beyond the aesthetic value of these works, there’s the artist statement: the diamond, symbol of luxury, associated with rarity and exclusivity is offered to the passer-by through art. The Diamantaire evolved his street work towards the art of galleries and participated in several group exhibitions in Paris and Zurich. Where you can see it: Paris, London, Miami, New York, Montreal, Zurich, Los Angeles. 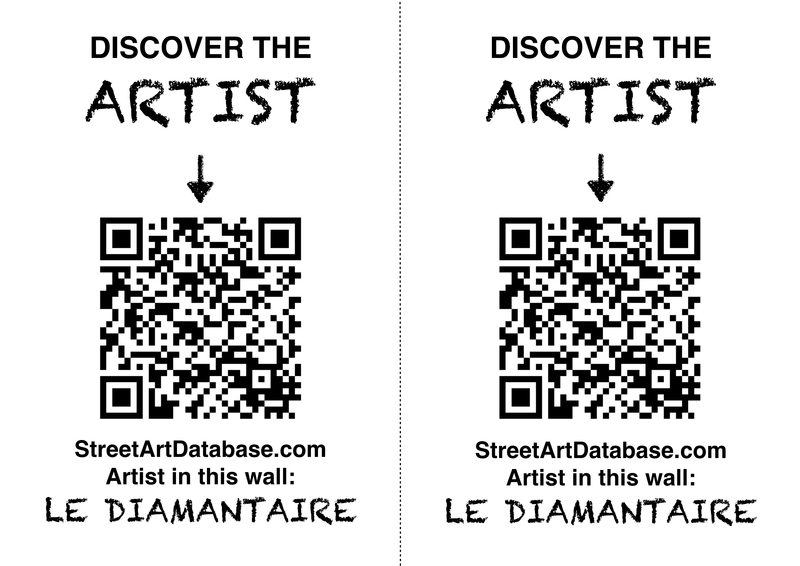 PRINT CODE: help tagging Da Cruz in the streets of your city! Posted in mosaicBookmark the permalink.